You have the option of using one of the catering companies accredited by the Bavarian Palace Department, which will provide you with individualized service. Please do not hesitate to contact us for advice. 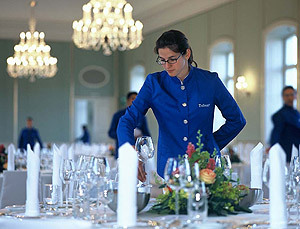 Catering in the interval is the exclusive prerogative of the Schlosswirtschaft Schwaige. Please note: When a catering company is used in the Orangery tract, 13% of the net revenue is payable to the Nymphenburg Palace and Garden Administrative Office.